Dr. Allan DellaBella is an internationally acclaimed sports injury chiropractor, and has provided chiropractic care to professional athletes, the U.S. Olympic team and patients as far away as California and the Bahamas. Patients choose our wellness center because of our whole body approach to sports injuries. We don’t just “cover up” pain with medication. Instead, we correct the underlying cause for the injury, providing long-term pain relief and reducing the risk of future problems. A sports injury can cause serious damage to the musculoskeletal system. Even a single disk injury can lead to chronic back, neck, leg and shoulder pain. Unfortunately, traditional medical care only treats the symptoms of sports injuries. Our approach to treatment is different. With every patient, we focus on identifying the underlying cause for an injury, such as a misalignment of the musculoskeletal system. Rather than relying on medication, Dr. DellaBella provides long-lasting pain relief through chiropractic adjustment. One of the most common athletic injuries is a strain or sprain. Soft tissue damage to the ligaments, tendons and muscles can cause pain and inflammation. Without effective treatment, these sports injuries will not properly heal. The body will then compensate for the injury pain by adjusting its movements, which can lead to new injuries. If you have sustained a sports injury, immediate care from a chiropractor is essential to preventing the build up of scar tissue and additional damage to the musculoskeletal system. Chiropractic adjustment is a safe and non-invasive treatment for restoring alignment to the spine that is especially effective when treating disk injuries. Dr. DellaBella uses the manual Cox adjustment technique, the golden standard of chiropractic care, to treat disk injuries that cause low back pain, leg pain and shoulder pain. Dr. DellaBella also provides care for patients with tennis or golfer’s elbow, a repetitive motion injury known by the medical term of lateral epicondylitis. The repetitive act of swinging a tennis racket or golf club can cause inflammation or tiny tears in the tendons that connect the forearm muscles to the elbow. When this occurs, it can be difficult for patients to grip or hold objects without intense pain. Chiropractic adjustment and massage therapy can promote internal healing, reduce inflammation and provide immediate pain relief. As one of the most accomplished chiropractors in the United States, Dr. DellaBella was invited by the U.S. Olympic Team to serve as their chiropractor. He also headed a U.S. Delegation to China to teach chiropractic techniques to Chinese physicians. Dr. DellaBella has worked with elite and professional athletes, including those in the NFL, NBA, MLB, NHL, PGA, LPGA, Tennis, NASCAR, Bowling, Wrestling, Soccer, Cycling, Motocross and Surfing. In working with these professional athletes, Dr. DellaBella understands the urgency and need to help patients heal from injuries in the shortest amount of time using the most effective rehabilitation strategies. Whether you are a professional athlete or a casual runner, Dr. DellaBella will provide the highest quality injury care and pain management to help you heal quickly and enjoy long-lasting pain relief. Are you ready to be active again? Get back in the game and schedule your diagnostic appointment today by calling us at 561-488-4000! Although dealing with any injury or illness can be a frustrating experience, a sports-related injury can potentially prevent you from participating in an activity that you love. Many sports injuries are caused by repetitive motion, so continued use of the affected body part, without the proper healing treatment, may lead to long-term discomfort and lack of mobility. This is especially the case with shoulder pain, knee pain, back pain and neck pain. At Shadowood Chiropractic Center, one of our specialties is providing ongoing care for athletes that focuses on not just repairing your injury but on keeping your body in top performance shape. This type of care ensures that the chance of future injury and pain is greatly minimized. Rotator Cuff Injury – if you are experiencing a limited range of motion, weakness, pain or stiffness in your shoulder, you may be suffering from this condition. The rotator cuff is a set of four muscles in the shoulder that are connected by a thick group of tissue fibers. These tendons can get worn down and torn through repeated overhead arm movements that use the shoulder muscle. Sports activities that put people at high risk for a rotator cuff injury include throwing a ball, swimming and swinging a tennis racket. Dislocated Shoulder – this is caused by a trauma to the shoulder such as in a hard fall or being struck by a hard object. AC Joint Sprain – typically happens with a fall on the shoulder when the hand is at the side of the body or with a fall onto the top of the shoulder. This kind of injury is common when playing hockey, rugby or falling forward when riding a bike and being pitched over the handlebars. Labral Tear – this type of injury occurs when the cartilage around the shoulder gets torn or damaged. Although hard to diagnose, labral tears may cause a clicking sound in the shoulder and result in an athlete’s inability to throw or move his arm with his usual strength or speed. At Shadowood Chiropractic Center, we focus on body maintenance as well as pain relief, so treatment at our office may include a combination of ongoing care routines such as massage, joint manipulation, nutritional counseling and physical exercises done in the office or at home on your own. We don’t want to temporarily mask your pain with drugs that may produce undesirable side-effects or cause other unrelated problems. We want to give you a holistic, non-medicinal choice for injury repair that will not only relieve your pain but provide you with tools to help you keep yourself strong, healthy, active and injury-free both on the playing field and off. Ready to experience sports injury healing in an all-natural, drug-free and non-invasive way? Call today to set up your consultation appointment at 561-488-4000. Nothing is more frustrating for an athlete, at any level of competition, than a debilitating sports injury that keeps you on the sidelines. Fortunately, your sports injury may respond beautifully to natural, non-surgical sports injury treatment in Boca Raton. Here are some common questions and answers about sports injury care from Dr. DellaBella, our Boca Raton chiropractor. What are some basic sports injuries that can be treated with chiropractic? Typical sports injuries include soft tissues strains, tears or ruptures; nerve damage or impingements; dislocations, and fractures. Our chiropractic team notes that disc herniation can also occur as the result of sports injuries caused or aggravated by spinal misalignments. An overuse injury often occurs from repetitive motion that stresses a particular set of tissues. 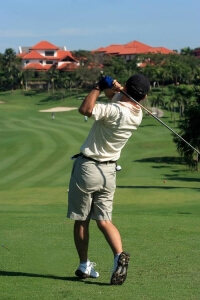 Swinging a tennis racket or golf club hundreds of times, for instance, can cause elbow tendonitis that requires treatment from our chiropractor. Runner’s knee is an example of a soft tissue strain; this injury is related to running for long periods on an incorrect or unbalanced gait. Whiplash, a painful condition featuring tissue damage, disc herniation and spinal misalignments in the neck, is not relegated to auto accident victims. If your head hits the turf the wrong way or you suffer a violent tackle, for example, you can easily sustain a case of whiplash that requires sports injury treatment in Boca Raton. How does chiropractic adjustment treat sports injuries? Chiropractic care facilitates your body’s natural ability to heal itself, instead of forcing the solution via surgery or numbing the surface symptoms with drugs. By correcting your spinal or joint alignment, we can undo painful nerve pressure while also improving your posture to help you ward off future injuries. What other forms of therapy can you offer? If you have an old sports injury that never healed properly, you may be suffering from adhesions, bands of internal scarring, that limit your range of motion and cause pain. Our Boca Raton sports rehabilitation team may prescribe deep tissue massage to break these adhesions up and permit full healing of the affected area. How quickly will I recover from my sports injury? We wish we knew! Each injury has its own particular quirks, and each patient heals at a different rate. Our staff will do everything possible to ensure that you heal quickly, but also thoroughly. How do I know if I have a sports injury? Sports injuries generally fall into two categories; acute and chronic. Acute injuries happen suddenly. Pain and swelling are usually instant. In this instance, you should immediately cease the activity and seek medical attention or schedule an appointment with our sports chiropractor for holistic treatment options. A chronic sports injury occurs over time and can include back pain, tennis elbow, runner’s knee and shin splints. These are also known as repetitive motion injuries, and chiropractic care can help reduce the associated pain and heal the injury. What types of sports injuries do you treat? Our Boca Raton team can successfully treat back pain, herniated and slipped disks, carpel tunnel, runner’s knee and tennis and golfer’s elbow with chiropractic adjustments and massage therapy. Can chiropractic care actually heal my injury and reduce pain? Receiving care from our chiropractor can successfully reduce your pain and heal your sports injuries. Chiropractic adjustments are effective at realigning the vertebrae and extremity joints. This ensures your spine and joints are properly aligned and helps reduce pain and inflammation while promoting proper function of the joint and surrounding ligaments and tendons. Each sports injury is different, which is our Boca Raton sports injury treatment in individualized for both the athlete and the type of injury sustained. If you still have questions about your specific injury, contact Dr. DellaBella for a consultation. Nothing beats a first-hand evaluation for detailed answers and recommendations that could help you enjoy your favorite sport — and a higher level of overall health — once again. We want to be your resource for sports injury treatment in Boca Raton!